9/2/2016Share this story on Facebook! Composition majors gain a foundation in traditional Western art music, while also exploring jazz, electronic music, film scoring, and other media. They have the opportunity to work with renowned composers, and they get to hear their music performed by highly skilled musicians on a regular basis. Walking through the graveyard of All Saints Church in Pawleys Island, South Carolina, which was founded in 1767, one will find many century-old grave sites. But one large gravestone is different from the others. It lies flat on the ground with simply “Alice” engraved in bold letters. On any given day, the stone may be covered with flowers or pieces of jewelry left behind by visitors to the site. This is the grave of Alice Flagg, a young aristocratic woman who died of malaria in the mid-1800s. Legend has it that she still haunts the area, searching for her lost engagement ring. This popular local ghost story is the basis for Alice Flagg, the first opera Joseph Kaz ’14 composed after graduating from Ithaca College. Alice Flagg was first performed in September 2015 at the John F. Kennedy Center for the Performing Arts in Washington, D.C., as part of the Page-to-Stage Festival, which features new works every year. The standing-room-only performance was so well attended that they had to turn people away. Kaz majored in composition at Ithaca College and worked closely with Dana Wilson, a professor of music theory, history, and composition. Early on, they discovered that Kaz had a knack for writing very dramatic music for voice. 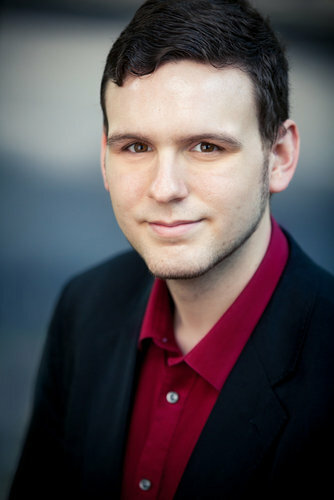 In his junior year, he wrote his first opera based on the Song of Solomon, a biblical text that celebrates love, and the Ithaca College Light Opera performed it in May 2013. Inspired by the ghost story that originated from his hometown, Kaz continued to pursue his passion for opera after graduation with his work on Alice Flagg. Kaz first conducted thorough background research on the story and the history of the family. The story goes that Alice fell madly in love with John Braddock, who worked as a lumberman. Alice’s family would not accept John as a suitor for their daughter because of his low-class status, so they sent Alice away to boarding school. Before Alice left, however, the couple became secretly engaged. While Alice was away at boarding school, she was bitten by a mosquito and contracted malaria. When she was sent home for medical care, her family discovered her engagement ring and threw it away. With this story in mind, Kaz built a character analysis and crafted the libretto, the text of an opera. “Keeping it too historically accurate isn’t the most exciting thing, so I had to make more things happen and make the characters deeper so that we as audience members connect with them and fall in love with them,” he said. After the libretto was complete, Kaz wrote the music that brought the story together. Kaz said that as a composer, watching his own performance come to life on stage in front of an audience is both stressful and exciting. 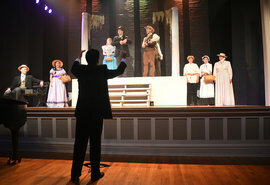 Alice Flagg was also performed in May 2016 at the Winyah Auditorium in Georgetown, South Carolina, not too far from where the ghost story originated. Kaz said he is grateful for the support he received while at IC and still thinks back to some of the fundamental lessons he learned.